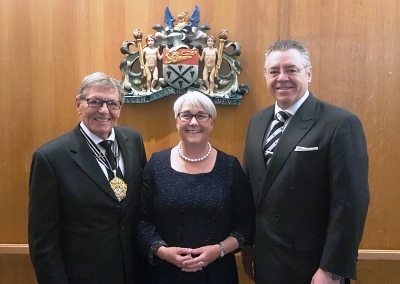 David Stringer-Lamarre, MD of FortisCL, is a member of the Court of the Worshipful Company of Glaziers & Painters of Glass. The origins of this ancient Livery Company of the City of London are lost in the ‘mists of time’, though the earliest recorded date is 1328. This lecture was skillfully delivered by Sarah Brown, Director and CEO of the York Glaziers Trust. In this illustrated lecture, Sarah Brown explored the status and meaning of the Great East Window of York Minster, the largest expanse of medieval glass in Britain. Sarah revealed its post-Reformation history and its implications for its condition in the 21st century, the context in which an ambitious and research-led programme of conservation was first launched in 2008. The lecture was followed by a supper in the River Room.